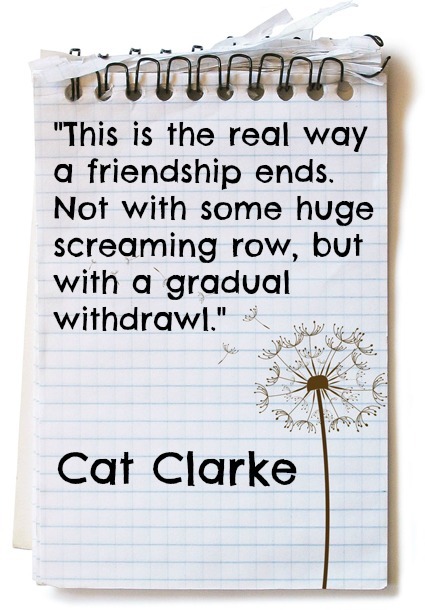 Most of us have experienced friendships that, for whatever reason, fizzled out for a time, or possibly, forever. Most of the time we look to place blame on who ended the friendship, what that person did to make us mad, or we point the finger at ourselves and focus on our own contribution to the friendship ending. While it seems to be largely human instinct to function this way, I also believe it’s unproductive. Sure, there are times when we screw up and we need to eat crow, apologize and learn from our mistakes. Other times we catch a case of life circumstances and we need to just chock it up and move on. This happens in friendships. All. The. Time. Being in my late twenties, I find that my friends can be all over the place in terms of their lives. I am married with three dogs, a cat, and ten chickens, for instance. I work at home in what can be a competitive field and also an unforgiving one. I have a routine that corresponds to that set of circumstances. Some of my girl friends are single, they have weekends free and can decide on a whim what they want to do. I have friends who are on the brink of marriage and their schedules are so packed I can barely get a moment of time with. Still I have other friends who are on the verge of parenthood and the only time I am likely to see is at the baby shower. The more time that goes by, the more I realize that these relationships ebb and flow, like the tides, and it’s a natural occurrence that can be good. It’s a part of the natural cycle. True friendships endure the test the time, no matter how long you have spent apart doing your own thing. In my life, I have never lost a true friend. So if you feel a friendship fizzling, don’t fight the inertia of it, just let it take its course; though it may be a disappointment, it could also be a blessing in disguise. Tell me...have you had a friendship fizzle recently? Did your friends change as your life circumstances (marriage, babies, or work promotions) came about, or have you had the same group of friends your entire life? Discuss in the comments section below! This is true, small towns can often be unforgiving in this way. For me, being comfortable with not knowing what I am moving on from is hard, but also a good exercise in patience and character building. Resolution comes over time, most often. There are times when I have thought to myself, "WHAT!? WHY?" and months or even years down the road, I see those reasons.